In North America, there are about 47 varieties of bumblebees. Many are in decline. 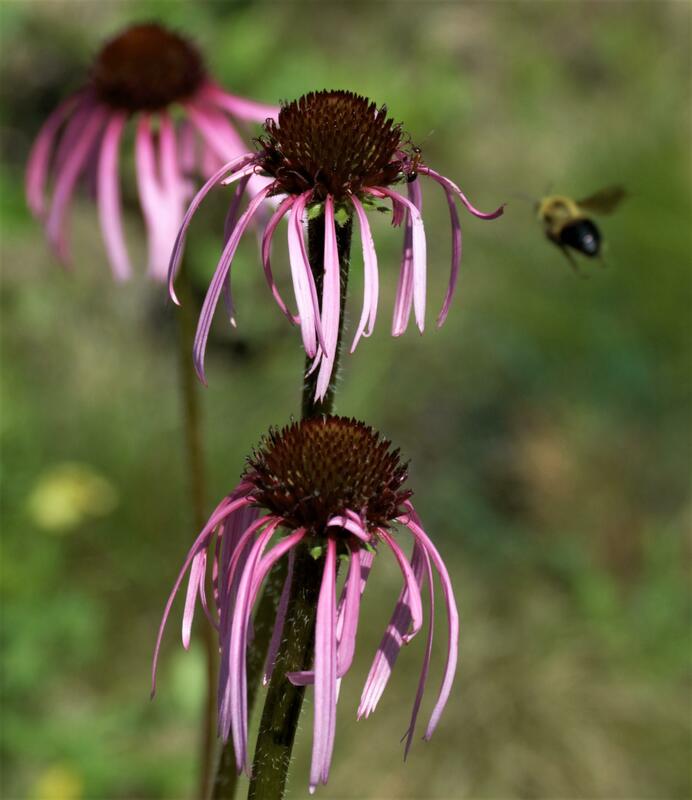 A bumblebee circles purple cone flowers, a native plant bees love. “Of those twelve species, about half of them have declined and the other half are stable,” said Thomas Wood, a post-doctoral research associate at Michigan State University. He recently completed a survey of bumblebees in the state. We found him in his lab at MSU. “So of the six that have declined, they’ve all declined by over 50% and one of them has become extinct, which is the rusty patched bumblebee,” he said. That is, extinct from Michigan. There are still some rusty patched bumblebees, but so few that they are now on the federal endangered species list. Why are bumblebees disappearing? “It’s a loss of flowers. Many of the bumblebees that are stable fly mainly earlier in the season and so they’re more on trees and shrubs. And then, many of the bumblebees that have declined fly later in the season and they’re more in prairies and they’re more on herbs and forbs,” Wood explained. Thomas Wood is a post doctoral research associate at Michigan State University. Prairie areas in Michigan have been disappearing. On top of that, a class of pesticides introduced about 25 years ago, called neonicotinoids, has been linked to declining bee populations. “They’re acutely toxic to bees and they’re used in agriculture. Almost all the corn that’s planted in Michigan, and in the Midwest more generally, is treated with these insecticides,” Wood said. They're also used on some other crops such as sugar beets and soybeans. Those insecticides are just one factor. In western Michigan, Amy Irish-Brown is with MSU Extension Service and works closely with fruit tree growers. She stresses farming practices alone are not to blame for the declining bumblebee populations. “We’ve lost wooded areas as progress takes place. And it’s not always just farming. It’s housing and other things that destroy those types of landscapes which are refuges for honeybees and bumblebees,” she said. It’s gotten to the point that farmers have to pay to bring in more bees, European honeybees. They actually rent hives during blossoming to pollinate crops. “Our recommendation used to be one hive per acre. Now, we like to tell people two hives per acre if they can. So that tells me we’re kind of understanding that our native bees just aren’t, there are not enough there to help us,” Irish-Brown said. Some orchards buy bumblebees from commercial sources to help. Bumblebees work harder. While honeybees don’t like to go out on windy or rainy days, bumblebees just keep buzzing from blossom to blossom. The amount purchased does not replace the declining populations, but helps local orchards a bit when they're needed. There is a way to help bumblebees; all bees, for that matter. And one expert in Grand Rapids says you can help. 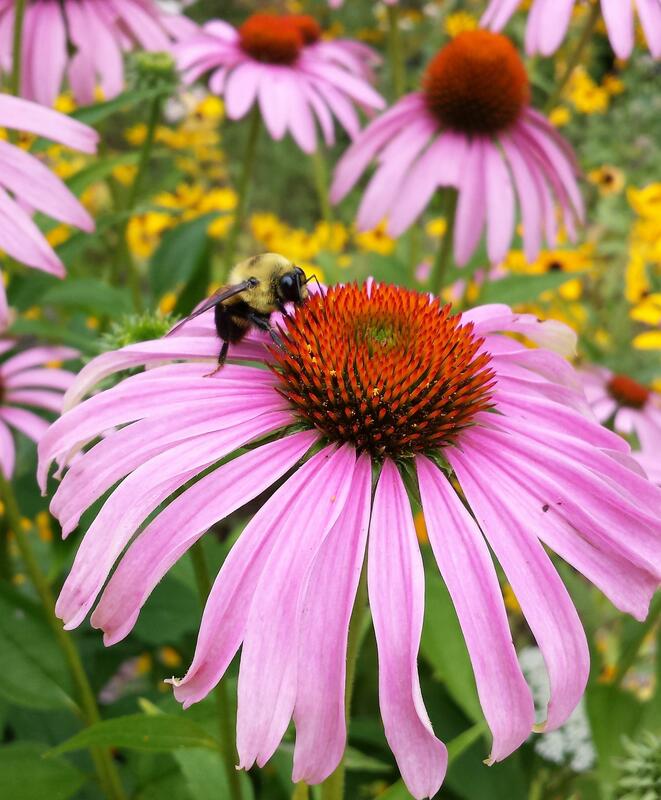 Rebecca Finneran and volunteers have planted a variety of small patches to attract bees at the MSU Extension Service's Grand Ideas Garden in Grand Rapids. LG: And where are we? LG: Well, lead me to the bee patches. That’s what I want to see. As Finneran took us on a tour of several small patches, she explained whether you have a small backyard or just planting containers at your apartment, you can plant a variety of flowering annuals, perennials and shrubs. Then watch to see which kinds attract the most bees. A chance encounter with a bumblebee near Michigan Radio's Ann Arbor studios last summer. There are all kinds of recommended plants (find them here). Finneran also says she knows people are afraid of bees. She says wasps and hornets have given all stinging insects a bad reputation. She says unless you’re actually allergic to bee stings, don’t worry. “Bees are really there just for food. They’re not there to sting you,” she said. The pollinating that bees and other pollinators do is responsible for about a third of the food that ends up on your plate. Those hard-working bumblebees aren’t just about flowers, they and other pollinators are essential to producing food.